Windows 8 has gotten bad reviews, its mobile push has stalled and it’s facing a murky market for corporate software. But despite all those headaches, Microsoft Corp.(MSFT) has seen its stock rising. The software giant’s shares have jumped 14% over the past three months. The stock has a current dividend yield of 2.82% and is a regular 15% per year dividend increase stock. The Company will unveil the new X-box next month. The worst may be behind this software giant. Microsoft reported Q3 results of $20.489 billion in revenue and EPS of $0.72, compared to consensus of $20.497 billion in revenue and EPS of $0.68. Microsoft reported March quarter EPS and operating margin ahead of consensus expectations with increased expense controls, while revenue was essentially in line with consensus expectations—with Windows, Microsoft Business Division, and Server & Tools sales falling slightly below estimates and the Online Services and Entertainment & Devices divisions exceeding forecasts. Although the PC market continues to put pressure on Windows and Office revenue and server shipments have been slow, Microsoft effectively managed expenses during the quarter and reported improving growth in OSD and Windows Phone. Going forward, although PC shipments are expected to remain weak in the June quarter, we expect the combination of more attractive price points, the ramp of new chipsets from Intel, and greater adoption by OEMs of touch screens for ultrabooks and laptops to drive greater adoption of Windows 8 devices in the second half of 2013 and into 2014 than the market appreciates (particularly in the business user segment with the eventual release of Surface Pro 2). Furthermore, we expect the end-of-life of Windows XP in April 2014 to drive growth in the professional PC segment. Based on these dynamics, we believe that the rate of decline in PC shipments is bottoming, and with continued better-than-expected cost controls, improving OSD and Windows Phone revenue, a new Xbox cycle on the horizon, and solid long-term competitive positioning and near-term product launches in MBD and S&T, we expect Microsoft’s recent outperformance to continue. Our fiscal 2013 estimates are adjusted to revenue of $78.812 billion and EPS of $2.68 from revenue of $81.514 billion and EPS of $2.78. We maintain our Outperform rating and our target price of $38. At a 9.7x NTM P/E multiple, Microsoft trades at a 33.8% discount to the S&P 500. For investors wanting to have their cake and eat it too, we have some great stocks to consider. All of these stocks carry the S&P Quality Rating of A, A+ or A-. Then, they all pay dividends and have a projected EPS growth of 15% or more for next year. So what you are getting is a fundamentally strong company that pays dividends and produce great earnings for potential price appreciation in the next year. All of these stocks are up at least 10% year to date easily beating the S&P 500. Here is the list of high quality stocks with high earnings growth. Computer Programs and Systems, Inc., (CPSI) a healthcare information technology company, designs, develops, markets, installs, and supports computerized information technology systems to small and midsize hospitals in the United States. Total revenues for the first quarter ended March 31, 2012, increased 10.2% to $44.5 million, compared with total revenues of $40.4 million for the prior-year quarter. Net income for the quarter ended March 31, 2012, increased 5.1% to $5.6 million, or $0.51 per diluted share, compared with $5.4 million, or $0.49 per diluted share, for the quarter ended March 31, 2011. CPSI is projected to increase earnings 19.2% next year. CPSI has a dividend yield of 3.22% which was increased 28% in the past year. CPSI has no debt and trades with a beta of 0.87. CPSI has an equity summary score of 7.5 out of 10 for a Bullish outlook. The Toro Company (TTC) designs, manufactures, and markets professional turf maintenance equipment and services worldwide. The company reported Q2 earnings of $2.26 per share, versus the Capital IQ consensus of $2.14. Revenues were $691.5 million, versus the analyst estimate of $676.4 million. For FY12, the company expects EPS of approximately $4.30, in the lower end of its previously announced guidance range of $4.30 – $4.35. This compares with the analyst estimate of$4.29. The company also expects revenue growth of 7% – 8% year-over-year. TTC is projected to increase earnings 15.9% next year. TTC has a dividend yield of 1.77% which was increased 10% in the past year. On May 24, 2012 the board of directors at Toro Co approved a 4 for 2 stock split. New shares will be granted on June 29, 2012 to shareholders of record on June 15, 2012. Beginning on July 2, 2012, the security’s price will reflect the split adjusted price. TTC has an equity summary score of 8.4 out of 10 for a Bullish outlook. Technology giant Microsoft (MSFT) just announced a new tablet device to compete in the portable computing market and the future release of Microsoft Phone 8. MSFT posts $0.60 Q3 EPS versus Capital IQ consensus forecast of $0.58. MSFT had solid results driven by outperformance in Windows, Server & Tools, and Microsoft Business Division, as PC demand has started to recover, continued adoption of Office 2010, SharePoint, and strong growth in SQL Server. MSFT revised operating expense guidance downward, now sees $28.3B-$28.7B for FY 12. MSFT is projected to increase earnings 15.2% next year. MSFT has a dividend yield of 2.61% which was increased 25% in the past year. MSFT has an equity summary score of 9.0 out of 10 for a VERY Bullish outlook. Investors have been suggesting that Apple (AAPL) do something like pay a special dividend with the $98 billion in cash sitting on the balance sheet. Apple finally moved into action on this topic. AAPL will pay a dividend of $2.65 per share quarterly, first payable on July 1, for a yield of around 1.8% at current pricing. Apple also will repurchase up to $10 billion in stock. We think these actions make sense, given AAPL’s considerable balance of cash and investments of $98 billion as of December 2011. We note that AAPL plans to use only U.S. cash and investments for these actions, given the adverse tax implications of repatriating foreign earnings. We think the dividend could attract new investors and investment to AAPL. AAPL is very close to hitting $600 following the announcement. While many shareholders agree with this move, some are being alarmist about the maturity of Apple as a stock. I do not agree with this alarmist theory. see it growing over the years similar to MSFT. 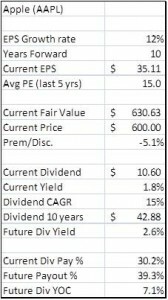 Using my stock valuation and dividend model (see chart below), AAPL is projected to be a great long-term dividend stock. It is projecting that Apple is trading at a 5% discount to a fair value of $630. The model is projecting that Apple will grow dividends 15% during the next 10 years. This dividend growth rate is comparable to Microsoft over the past five years. Using the dividend growth rate, Apple will have a yield on cost of 7.1% in 10 years with a 39% payout ratio. 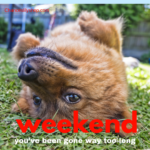 As a reader of this blog, you know we focus on generating monthly income from investing. A favorite and safe way to accomplish this goal is through writing calls on stocks. Done correctly, you can achieve yirlds in the double digits without the worry of a dividend cut or significant price decline. When you hear a suggestion to purchase a stock with a 15% yield you automatically go on code alert as there must be something wrong with a stock yielding this much money. In most cases you are right to be alarmed but today I will show you a safe way to get a 15% yield. In the current market, Microsoft seems to be a hated stock as it is large and its fast growth days are behind it. However, you can use a stock like this to your advantage if traded properly. Microsoft is trading at around 10 times earnings indicating it is relatively cheap at the current price of $27.25. Microsoft is sitting on about $50 billion in cash equivalents and still has hugh profit margins. This is a perfect setup for a safe stock to use for covered call trades. 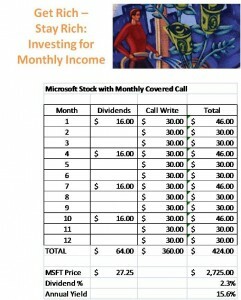 The strategy is to buy 100 shares of Microsoft stock and use a monthly call trade to generate monthly income. Microsoft pays an annual dividend of $0.64 per share of $0.16 per quarter. This equals a yield of 2.4% in dividends. So how do you get from a 2.4% yield to a safe 15% yield? 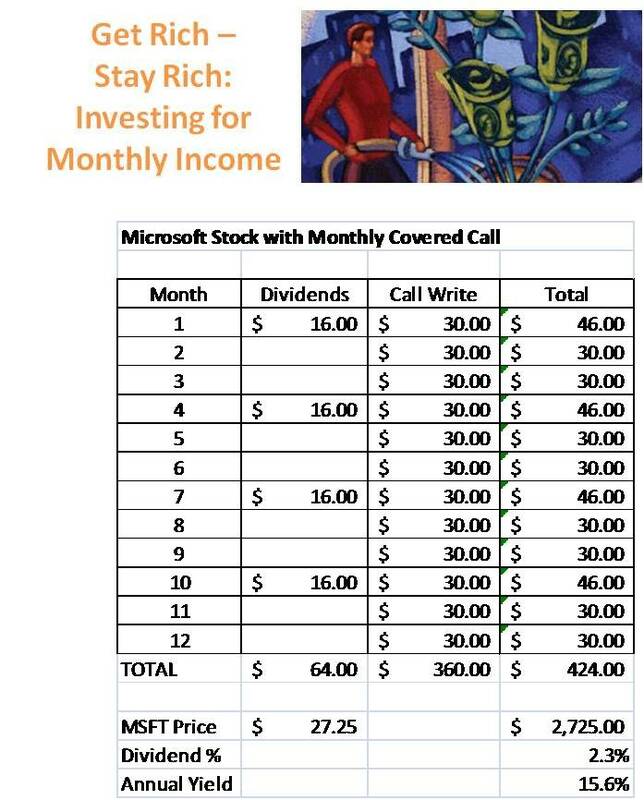 This is where you add the monthly covered call write. On average, an at-the-money call will sell for $0.30 for MSFT. Some months have higher premiums than others and vice versa. By selling 1 ATM call each month for an average of $30 per month will generate a total of $360 over a one year period. based on a total cost of $2,725 for 100 shares, the covered call will produce a yield of 13.2%. By combining the covered call yield (13.2%) with the dividend yield (2.4%) you get an annual yield of 15.6%. Microsoft stock has support around the $24 level so there is little downsize risk. The stock has a typical volatility at around 25% or lower. In the case the stock moves in the money, let it get called away and keep the premium. If not called away, then continue to sell monthly calls ATM to generate more income.